Believe us — we love all of the furry community members that reside in the Merrimack Valley area. They’re cute, welcoming and friendly, and more importantly, they keep our favorite residential clients company! However, it’s important to keep in mind that having a pet (or several pets) means you’re going to have to check on the HVAC systems in your home more so than pet-less homeowners. That’s why in today’s blog post, we’ll go over several HVAC maintenance tips Merrimack Valley homeowners should keep in mind if they have a cat, dog or some sort of other furry pal living in their home. At Lamco Systems Inc., our HVAC contractors offer an array of HVAC services, ranging from heating system installations to A/C repairs. Our experienced team can also help out our pet-owning homeowners and routinely scope out your HVAC systems to ensure everything is working as it should be. If you’re looking for a Top Rated Local® HVAC company, give us a call today to find out how we can assist you. 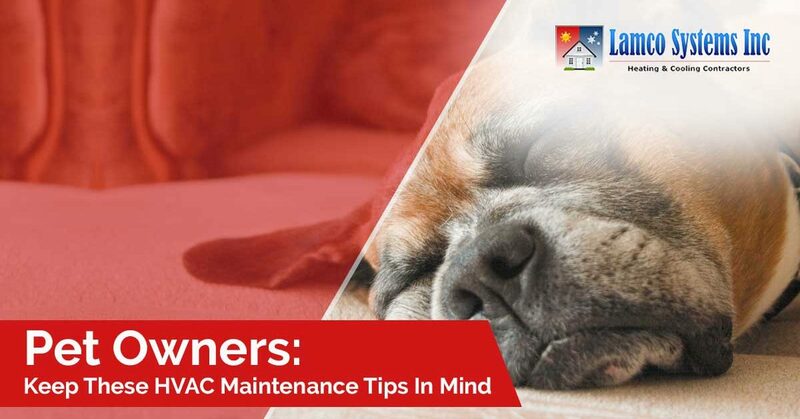 Continue reading below for four HVAC maintenance tips you should practice as a pet owner between your maintenance check-ups. It can be easy to forget about bathing your pet, meaning you might go several months without giving your furry pal a bath. Don’t do this! Not only is this detrimental to your pet’s health, but it’s also terrible for your HVAC systems. The cleaner your pet is, the cleaner your home will be since you won’t constantly be vacuuming or cleaning up fur. On top of that, you’ll improve the overall air quality in your home. In fact, according to the Asthma and Allergy Foundation of America, regularly bathing your pet can reduce the amount of fur, dander, dust and pollen that enters your home. Another task that can be easy to forget about is properly maintaining your air filters. Pet hair is notorious for clogging up the air filters in your home and for reducing your HVAC system’s airflow, so if you aren’t regularly cleaning and/or replacing your air filters, you’re going to put you and your family’s health at risk. We suggest checking on your filters about every three months. Sure, fans are a great way to keep the rooms in your home cool, but they’ll also quickly circulate any pet hair or fur in your home. Turn on your fan only when necessary to avoid getting pet debris all over your home (and stuck in your home’s HVAC systems). Sure, you can take all of these tips to heart and practice them religiously, but if you don’t schedule regular maintenance check-ups with our professional HVAC contractors in Merrimack Valley, you’ll never know how your HVAC systems are actually doing. Luckily, at Lamco Systems, we offer high-quality residential HVAC work that includes geothermal services, indoor air quality services and more! We’ve served the local community since 1967, and there’s a reason we’ve become most homeowners go-to choice when it comes to their heating and cooling systems. Find out why we’re a Top Rated Local® HVAC company and contact us today to schedule an appointment. Also, don’t forget to scope out our season specials for discounts and other service specials here.